Google Pixelbook is an all-new, high performance Chromebook. It sets a new standard for performance and flexible design, while offering all the benefits of using a Chromebook. Google Pixelbook’s 4-in-1 design incorporates an aluminum unibody case, 12.3-inch quad HD touchscreen display and a 360-degree hinge. This means it excels as a traditional laptop, with a full-sized backlit keyboard and a powerful Intel Core CPU. Rotate the display into tent or entertainment mode, even use it as a tablet. This high performance Chromebook is also the first laptop to feature built in Google Assistant. 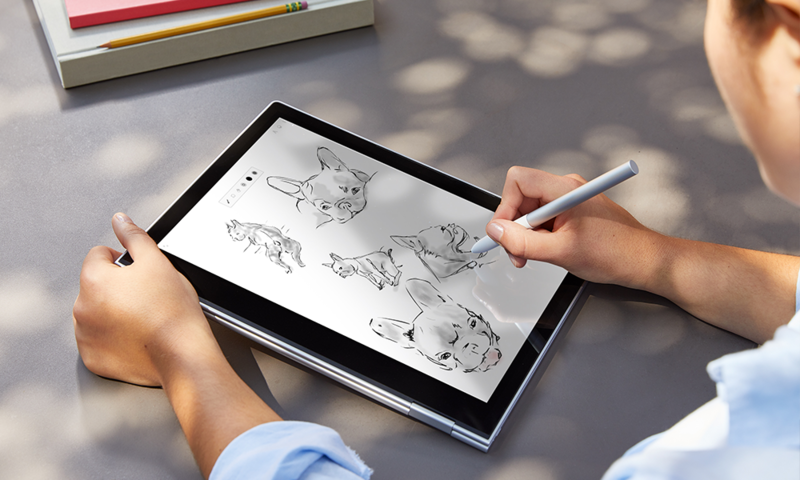 It has access to all the apps you count on, including the Google productivity suite, creativity apps (all the better to use the optional Google Pixel Pen pressure-sensitive stylus), and entertainment from Google Play to Netflix and Spotify. Enjoy 10-hour battery life, plus automatic software and security updates. Google Pixelbook sets a new bar for high performance in a premium Chromebook, and features an incredibly flexible 4-in-1 design. 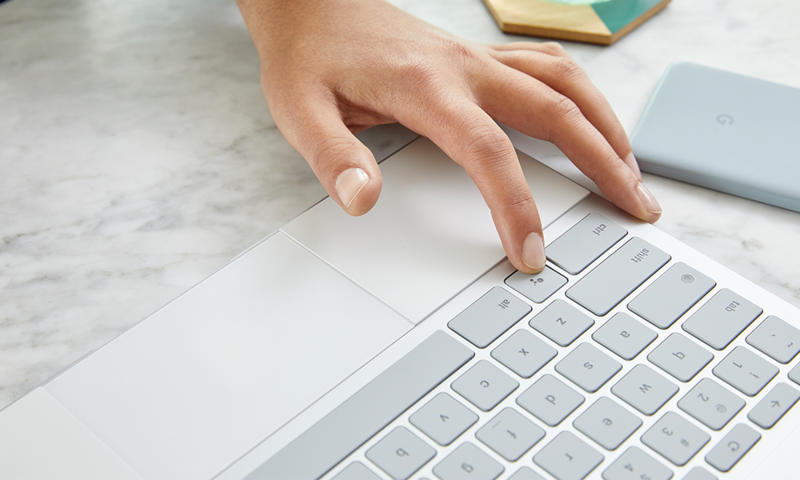 Google Pixelbook’s sleek and strong aluminum unibody enclosure measures just 10.3 mm thin, and at just 1.11 kg (2.45 pounds), it’s feather light. The 12.3-inch, quad HD high resolution LCD display is protected by Corning Gorilla Glass. Inside, a 7th generation Intel Core CPU provides the power to run Chrome OS and apps. The full-sized, backlit keyboard is complemented by a super-sized trackpad. Or, use the optional Google Pixel Pen, a pressure-sensitive, lag-free stylus that lets you write, draw and design naturally. 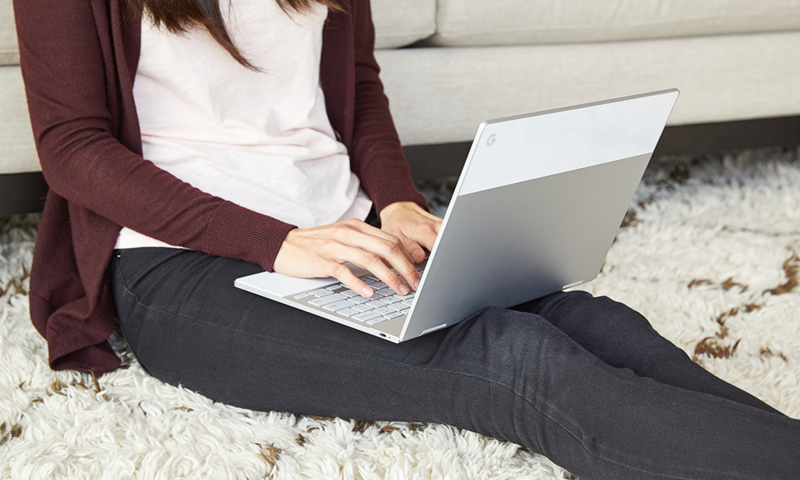 Use Google Pixelbook as a traditional laptop. Or, rotate the touchscreen display on its 360-degree hinge to watch movies in entertainment mode. You can even fold Pixelbook into a tablet. Google Assistant is the AI-powered virtual personal assistant that helps make Android smartphones so popular, and provides the brain power for Google Home smart speakers. Google Pixelbook is the first laptop with Google Assistant built in. You can use your voice, or press the dedicated Google Assistant key to summon Google Assistant. Circle an image or text on your Pixelbook with an optional Google Pixel Pen, then press and hold the pen’s button and Google Assistant will automatically provide you with relevant information. Say “OK Google” and you can ask questions, check your schedule, or use Google Assistant for voice control of music and video playback on your Pixelbook. The Google Pixelbook is a Chromebook. That means ease of operation and intuitive controls. Automatic software updates ensure your laptop always has the latest features, and security is up to date. It also means all-day, 10 hour battery life. Google Pixelbook runs all your favourite apps, so you can be productive, and have fun. The full Google suite, including Google Docs, Google Drive, Gmail and Google Photos is ready to use. Get creative with Infinite Painter or AutoCAD. Use the optional Google Pixel Pen with SketchBook. Post your photos on Instagram. Listen to your favourite playlist on Google Play Music or Spotify. Watch the latest viral videos on YouTube. You can even download movies from Google Play Movies and Netflix to watch offline later on that beautiful 12.3-inch display.